We’re still working our way through It’s A Small World and if you saw last week’s post, then you know that we learned about Natural Wonders of the World and did a cool Dripping Waterfall Invitation to Create Process Art Experience. This week, it’s all about the Man Made Wonders like The Great Pyramids, Machu Picchu, St. Basil’s Cathedral, The Leaning Tower of Pisa, and The Great Wall of China. 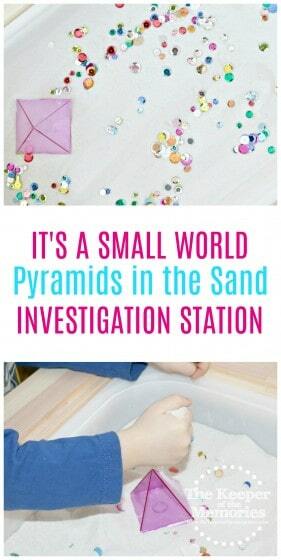 And for today’s activity, it’s off to Egypt to explore pyramids in the sand with this fun investigation station. 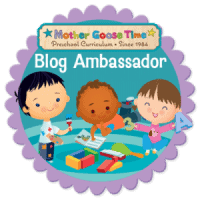 The little guy and I are head over heels in love with Mother Goose Time. And this month’s It’s A Small World theme has been no exception. We’ve learned about everything from cameras to maps and globes as we’ve traveled around the world. If you’re interested in teaching your little kids about The Great Pyramids, then definitely keep reading. The Great Pyramids are in Egypt. They have four sides and are made of stone blocks. It took many years to build the pyramids. Mummies were wrapped with bandages and placed inside them. Use a glue gun to attach four cardboard triangles together. 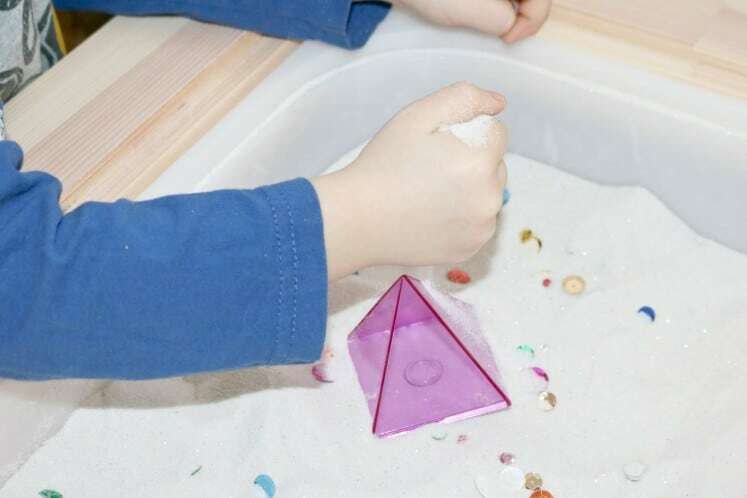 Fill the tray or sensory table with sand and beads or pretend jewels. Encourage children to hide objects underneath the pyramid. What fits under the pyramid? What shape do you see in the pyramid? What do you think it would be like to live in a pyramid? 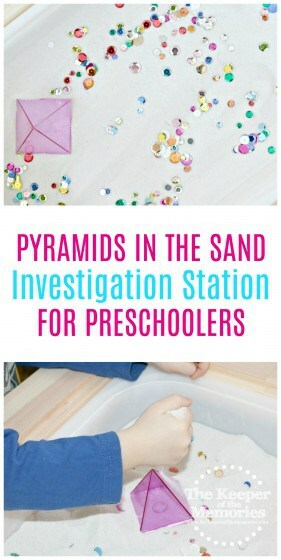 Don’t forget to check out our Preschool Desert Theme Cubed Pyramid STEAM Station too! We had to switch things up for this activity. My glue gun is packed away for the time-being, so I grabbed the square pyramid from our Learning Resources Geometric Solids * and we used that instead. 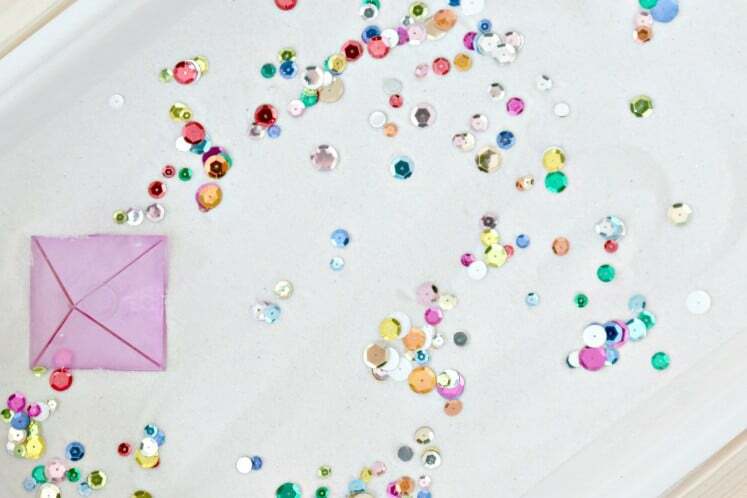 You know you’re winning at this preschool homeschool mama thing when you buy a package of sequins. Just sayin’… I have never seen the little guy so thrilled about a sensory activity before. This was one of those things that we’ll definitely have to do again. It could be a lot of fun with all of our Geometric Solids as a way of reviewing three-dimensional shapes.